AbramoviÄ‡ giving a virtual tour of the project in Hudson. The Marina AbramoviÄ‡ Institute in Hudson reached its Kickstarter goal today -- $600,000 raised for the "long-duration performance art" facility. The Kickstarter campaign runs until Sunday afternoon. The money raised is going toward phase one of the project. MAI says AbramoviÄ‡ has put up $1.5 million to this point. So the Kickstarter money will push the total over $2 million. The whole project is projected to cost $20 million. Looking through the various funding levels, the distribution caught our eye. As you might expect, there were more than 1,000 funders at the $1 level (reward: a hug from AbramoviÄ‡). But there were also 21 people who pledged $10,000 or more. AbramoviÄ‡ is probably the most famous performance artist in the world, thanks in large part to her MoMA exhibit The Artist Is Present. So that fame, plus the out-there ambition of the institute, definitely helped the fundraising campaign. And a naked Lady Gaga probably didn't hurt, either. The Kickstarter campaign for the proposed Marina AbramoviÄ‡ Institute in Hudson got a burst of attention Thursday after it posted a clip of Lady Gaga practicing the "AbramoviÄ‡ Method" -- "a series of exercises designed to heighten participants' awareness of their physical and mental experience in the present moment" -- at a "three-day retreat in upstate New York." Gaga and AbramoviÄ‡ makes sense -- Lady Gaga is probably a performance artist more than anything else. At this event, called THE EMBRACE, Marina will thank everyone who has joined her to create Marina Abramovic Institute with a personal hug. THE EMBRACE will be held in two undisclosed locations, one in New York City and one in Europe, with exact dates and times to be announced. Founders who are unable to attend will be offered a special reward in lieu of a hug from Marina, to be revealed shortly. The plan for MAI is to provide a space for "long-duration performance art" at a building in Hudson. A bunch of details about plans for MAI were posted online this past spring -- they're ambitious (the building design includes contributions from Rem Koolhaas) and, depending on your point of view, kind of bonkers (sleeping cocoons and a blood bank). The Marina AbramoviÄ‡ Institute in Hudson -- a facility for "long-duration performance art" created by the famous performance artist -- has a Kickstarter running for the project. And it's a big goal: $600,000, by August 25. An institute for the benefit of all is best funded not only by a few large donations but also by smaller contributions from the people it hopes to serve. By inviting the broader public to contribute to our early development, Kickstarter helps to affirm and build the engaged community necessary for sustaining MAI into the future. We have designed rewards that encourage backers to engage with time-based and immaterial works. With your contribution, you become a founder of the institute not only financially, but also conceptually, by partaking in the very experiences we hope to create. It goes on to say that AbramoviÄ‡ has already put up $1.5 million toward the project. 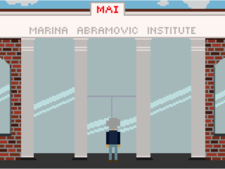 Funder awards range from a download of an 8-bit "Digital MAI" game ($5), to a personal session with AbramoviÄ‡ via webcam to learn the "Abramovic Method" eye gazing exercise ($1000), to the $10,000 level ("Marina will do nothing. You will do nothing. You will not be publicly acknowledged"). A bunch of details about plans for MAI were posted online this past spring -- they're ambitious (contributions from Rem Koolhaas) and depending on your point of view, kind of bonkers (sleeping cocoons and a blood bank). But the really new and different stuff usually does. 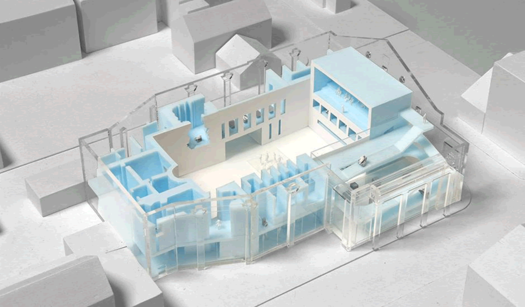 The plans include building a "white box" inside a former theater building (that was more recently used for tennis). There's now a better look at the planned Marina AbramoviÄ‡ Institute in Hudson -- a facility for "long-duration performance art" -- thanks to a new website for the project. The eponymous artist is well-known for this sort of this work, most famously for The Artist is Present at MoMA. And the Hudson facility -- which is being designed by an architectural team that includes Rem Koolhaas -- looks ambitious. In a video posted today, AbramoviÄ‡ says she hopes it might "change the consciousness of our society today." + A "contract" in which people pledge to spend at least six hours at the institute. + Visitors will be asked to leave behind watches, telephones, computers, and cameras -- they'll then be outfitted with lab coats and noise canceling headphones. + There will be various chambers: for drinking water, eye gazing, and so on. + A "blood bank" aiming to collect "250 drops of blood from the most influential scientists, artists, spiritual leaders, writers, philosophers, and musicians and to preserve a bank of these drops inside MAI." + A chamber devoted to Tesla. + Sleeping cocoons for people fall asleep during performances. It all has the feeling of something from science fiction. MAI is a $15 million project, according to its website. It's aiming to open in 2014.